I still buy print books: these are from my “to read” shelf. But half the books I buy now are for an electronic reader. About half the books I read now are just electronic files on a Kindle. No creases on the cover art, no dog-eared pages, no margins to write in. This is one thing ebooks cannot replicate: the stuff that happens to the book during the reading process. Somehow, electronic highlights and comments on an ereader are not quite the same. Do you fold back your covers? Often I can’t resist, as I start a new book, pressing the cover open: a loved book is a creased book, after all. And despite all my efforts to stop them, successive cats I have owned have ALL enjoyed chewing the corners of my books, tell-tale fang holes appearing mysteriously after I’ve been out of the room. 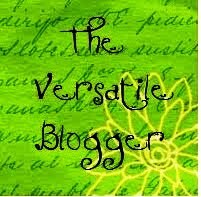 When I was growing up, we were taught never to write in the margins of books. So-called “marginalia” was acceptable only in a text book and then only if you owned it and you wrote in pencil. On a novel, though, the most you could do was write your name and maybe the year on the top right of the title page. It goes without saying that writing anything on library books was forbidden. So, most of my old books are pristine: but now I wish I’d broken the rules and written my thoughts in the margins. I made an exception when I was studying German language and literature at university. German was hard and I’d go through texts meticulously, translating every word I didn’t know. Recently, I came across one of my books from that time, a Hörspiel—a radio play— Zum Tee Bei Dr. Borsig, by Heinrich Böll. As well as copious and tedious translations in pencil, my 19-year-old self had written in the margin of one page, “Sooo boring”! Go back further to myself as a child, aged about 13. My family and I had lived in Los Angeles for a few years and I’d acted in some TV shows and films, so I fancied myself as quite the director-producer-performer when we returned to New Zealand. Back home from Hollywood though and it was back to amateur stage shows in and around Auckland, and fierce competition at auditions. 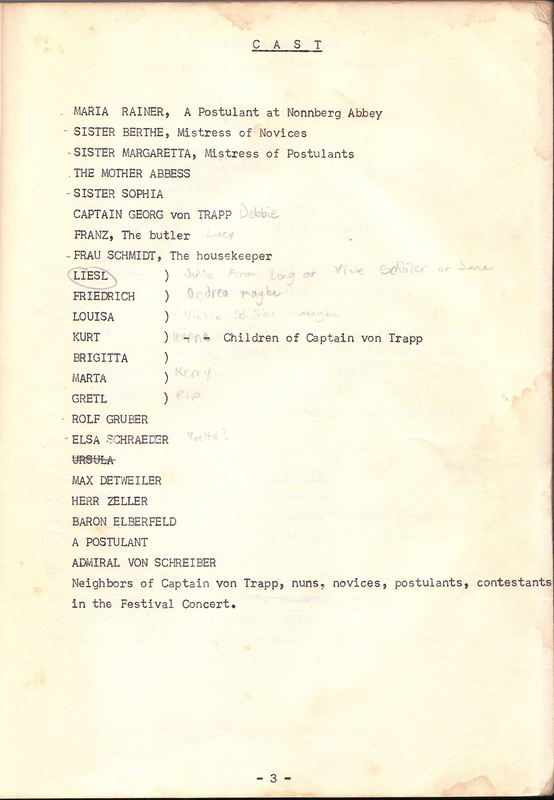 You were always supposed to give back scripts at the end of a production, but somehow, I still have a script from a 1970s production of The Sound of Music, a typewritten, plain brown-covered script stamped throughout with “TGA Choral and Operatic Society Library”. 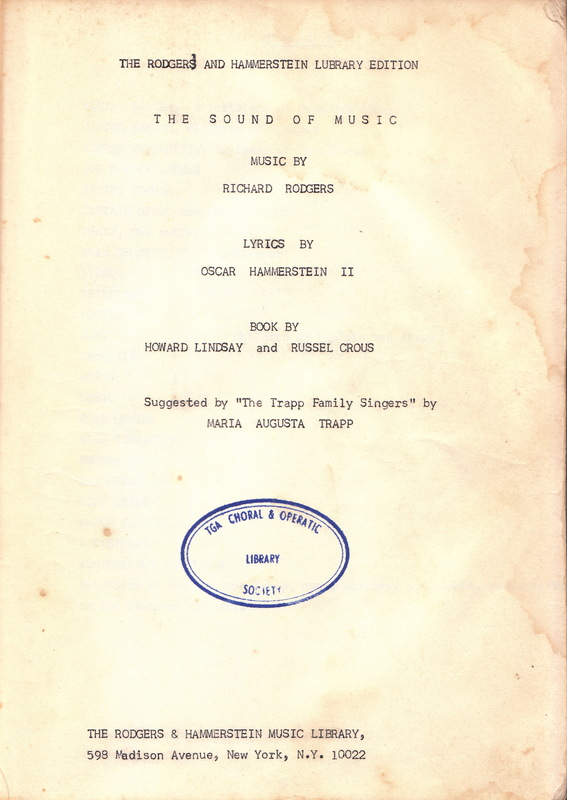 Although the script says it’s published by the Rodgers & Hammerstein Music Library, I somehow doubt that, because on the title page in capital letters, it says it is “THE RODGERS AND HAMMERSTEIN LUBRARY EDITION”. Yes, a typo. Until recently, I had forgotten about this script, but my mother found it stored in a box and gave it to me. 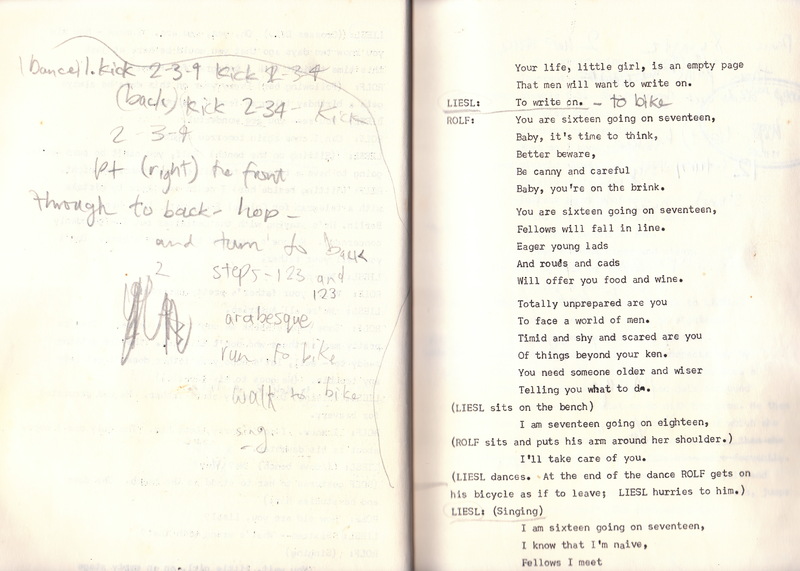 In it is a lot of marginalia by various actors who performed in the show over the years—pencilled-in dance steps, rehearsal dates, changes to lines, stage directions and so on. On p. 3 is the cast list, and you can still make out my additions: I’ve obviously been dreaming (quite ridiculously) about producing The Sound of Music at school, because beside some of the characters on the list, I’ve written the names of various friends I thought might be right for the role. Never mind that we were an all-girl school, and Debbie would be cast as Captain Georg von Trapp, while Lucy would have to make do as Franz the butler, and Andrea would be Friedrich. There is no name beside the lead character of Maria—of course, I would have been secretly casting myself in that role. As ebooks take over (and don’t get me wrong, I love this format for its portability), and even actors use tablet computers to rehearse their scripts, marginalia like this will no longer be made. 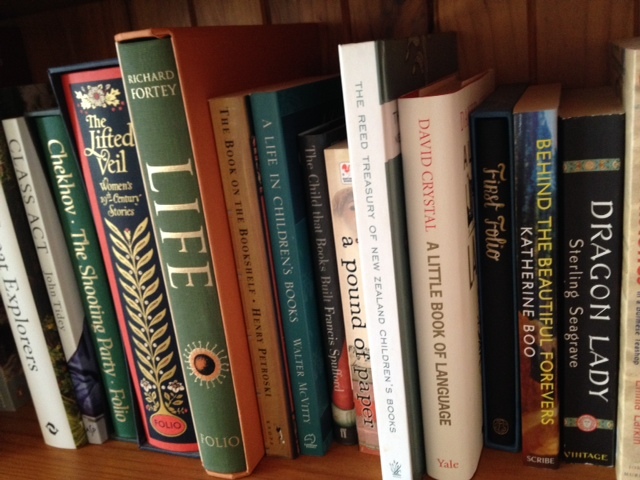 How we read our books, how, why and where we marked them: these are fascinating insights into our lives and times.